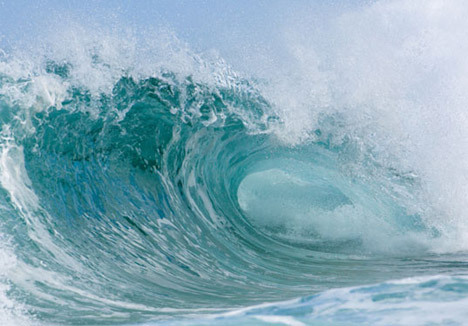 Ocean Power Technologies Inc. has signed an exclusive agreement with three Japanese companies to develop a demonstration wave energy station in Japan. 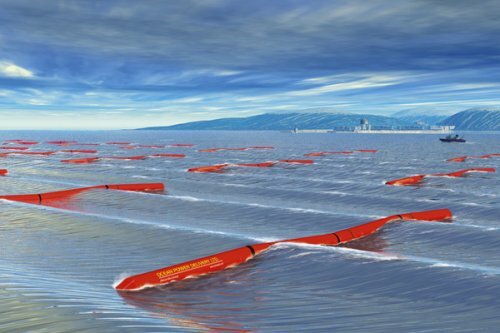 Idemitsu Kosan Co., Mitsui Engineering & Shipbuilding Co. and Japan Wind Development Co. comprise this consortium and have invited OPT to become a member of this Tokyo Wave Power Initiative. This is OPT’s first venue in Japan and complements OPT’s global strategy to form alliances with strategic partners in key markets. OPT now has a range of power generation projects globally, including those in Oregon and Hawaii in the U.S., Scotland and Southwest England in the U.K., Spain, Australia and now Japan. Under the anticipated agreement to build the demonstration plant, OPT said it will sell the equipment for the power station to the The companies in Initiative. And they will provide manufacturing and maintenance of the power stations and on-going plant operations, while OPT will provide its PowerBuoy technology and appropriate subsystems. Off the north coast of Scotland in waters 10 to 12 meters deep, ocean energy developer Aquamarine Power Ltd. has bolted its Oyster wave energy converter to the ocean floor and expects to be generating power by year’s end. 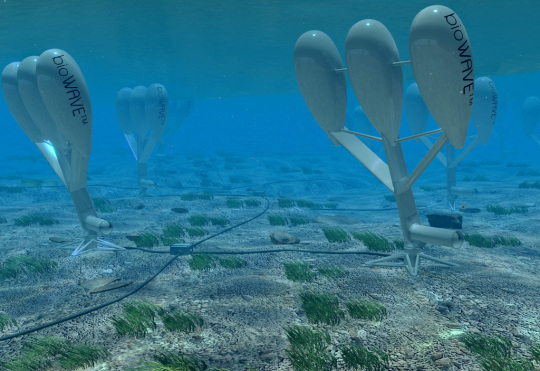 The Oyster is designed to capture energy from near-shore waves. The system includes an oscillating pump fitted with double-acting water pistons. 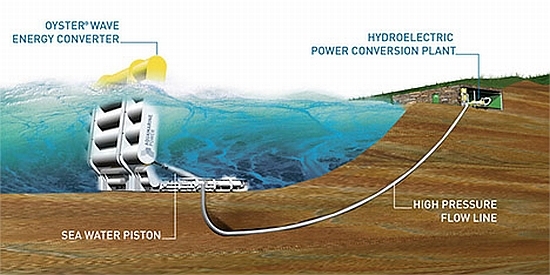 Each wave activates the pump, delivering high-pressure water by pipeline to an onshore turbine that generates electricity. All electrical components of the Oyster are onshore, making it durable enough to withstand Scotland’s rough seas, McAdam said. 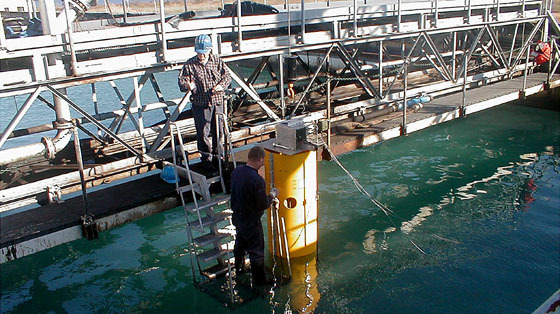 Marine constructor Fugro Seacore installed the Oyster converter under a $2.9 million contract.